Selenium with TestNG framework is a popular open source testing tool primarily used for automating web applications. Currently, the business requires rapid development, build and testing. Selenium plays a vital role in performing automation testing thus reducing the testing time. Using test automation tool in isolation is not a good choice in CI, CD. Testing in isolation creates silos, affecting delivery time for extended software development teams. The test automation results and reports need to be immediately shared across the stakeholders revealing the overall stability. Kovair Omnibus integration can increase the quality of the delivery by providing a seamless connection between Selenium and other lifecycle tools like HP ALM / HP QC, Bugzilla, JIRA, and TFS etc. In a typical scenario, Kovair Omnibus along with the Selenium adapter can capture test scripts and execution results directly from the IDE to Kovair. Thus the adapter can trace back the related artifacts in Omnibus in real-time. Test execution results, logs and defects created in Selenium can be immediately added to defect management tool like JIRA, Bugzilla or Test Management tool like HP QC, Test Link, and IBM RQM. Thus Kovair Selenium Integration Adapter leverages the value of Selenium while working with the existing ALM tools. 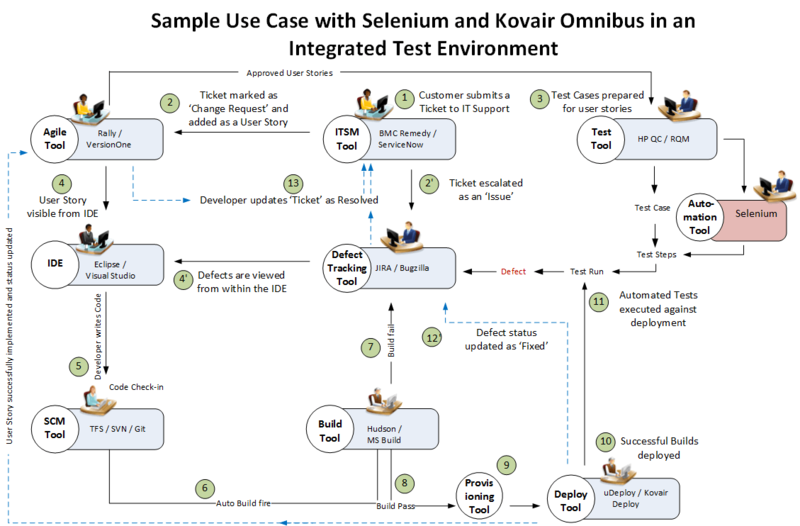 ‘Kovair Selenium Integration Adapter’ ‘Kovair Selenium Integration Adapter’ exposes the Test Suite, Test Case, Test Case Result, Test Execution, Test Execution Result, Defect, Files, Classes and Methods from Selenium (using TestNG) as traceable items in the integrated ALM scenario. The primary benefit one can achieve using Kovair and Selenium adapter is to execute a test from Kovair’s single interface on any configured host without going inside Selenium. Also, one can schedule an execution for a future date using Kovair interface. The integration thereby helps QA teams to adopt a seamless communication channel for collaborating on issues/ defects with their development counterpart. Bugs identified in Selenium can be reported back to connected IDE tool like Eclipse, tracked in JIRA and traced back to requirements in Jama. The adapter components are: 1) Kovair Selenium Adapter which is a web service, 2) Kovair Selenium Agent service which is a window service and 3) NetBeans plugin. Kovair Omnibus not only supports running automated test scripts from within Kovair platform, but also automates build to deploy to test execution process using its configurable business policies. Using a single platform of Kovair, users can import test cases from test tools, execute test automation scripts in Selenium for corresponding test cases, derive test automation results and automatically notifies developers for the defects to be resolved. Integrating Selenium with Kovair Omnibus platform and in turn with other integrated ALM and defect tracking tools provide immediate tracking and resolution of defects. E.g. Failed Test Case Results in Selenium are pushed back into Kovair Omnibus and in turn into other tools like HP ALM, JIRA, Bugzilla. So there are no silos and project progress can be tracked in real time by project managers and other stakeholders. Kovair Selenium Integration provides the platform for automated event–action based activities saving time and energy for employees and paving path for improving their productivity, skill sets leveraging efficiency organization wide. By letting team members to continue using the favorite tools of their choice automatically boosts productivity. Kovair integration with Selenium automates the deployment of test environments, including the tool, scripts and test data. It collaborates around the application architecture to make it as-easy-as-possible for automating the entire process of deployment. Kovair Integrated Test Management – iTM framework brings automation in the process of Build triggering, Provisioning, Deployment, Testing, Test Automation and Defect Tracking to help users achieve Continuous Integration – CI and Continuous Delivery – CD, while adopting Business DevOps. The following use case diagram explains how Kovair-Selenium integration helps QA and development teams, using different tools of their choice, collaborate on bugs/defects in real-time, resolve and expedite delivery cycles for improved product or service quality. Adds defects recorded in Selenium to defect tracking tools like JIRA, Bugzilla and Change Management tools. Selenium automation test scripts can be directly executed through policy from within Kovair platform and the results, reports and log data can be retrieved immediately and delivered to all integrated ALM tools. Synchronization of test artifacts with development and delivery cycles helps project teams to achieve Continuous Integration and Continuous Delivery. Exposes Selenium Test artifacts like Test Suite, Test Case, Test Case Result, Test Execution, Test Execution Result, Defects to Kovair and Kovair-connected tools and their users. Support for Add, Modify Delete Events on Selenium artifacts and collaboration of those data to Kovair and other integrated tools. Relation exposed between any two exposed Selenium entities e.g. Test Suite to Test Case, Test Case to Test Case Result, Test Case Result to Defect, Test Execution to Test Suite, Test Execution to Test Execution Result.